The post which follows will be the first of four. Here I will simply look at some currency data, in an attempt to put my finger on the first crack which has appeared in the edifice of emerging market solidity. Later this week I will try to address Turkey's fundamentals as I see them, and explain why I feel there are grounds for some considerable optimism about Turkey's medium term economic future. In the third post I will examine some of the outstanding issues which still confront Turkey, with particular emphasis on the pension reform situation. The fourth post will then attempt to look at all that has gone before from a theoretical perspective, and will focus on a comparison between Turkey and some of the weaker EU12 emerging economies. 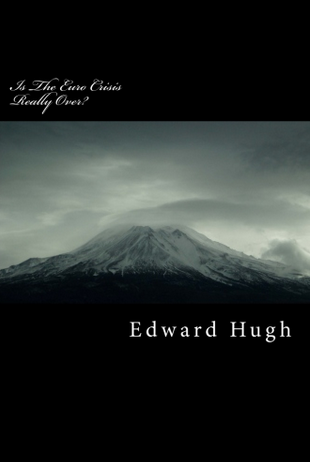 It is hoped that all of this will help to understand the "phenomena" as we are seeing them, and will enable us to draw together theory and fact in a way that helps us to better forsee events as they unfold, especially in the context of the present emerging markets credit crunch. So let's start out by getting our feet well and truly on the ground, and taking a rather close look at what has been going on in some parts remote corners of the global currency markets in recent days. If we do this we will find that one of the things which has become reasonably clear in this world of suddenly accelerating uncertainty is that the Turkish lira is weathering the most recent bout of emerging market stresses much better than many might have expected, and certainly better than some of the comparable East European currencies - in particular the Polish zloty, the Romanian leu and - even if to a slightly lesser extent - the Hungarian forint. 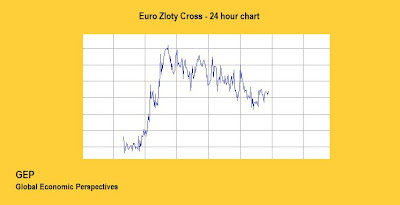 One thing to bear in mind when looking at these charts, since they are all cut against the euro as a reference currency to comparison easier, is that up here means down - ie you have to give more of the local currency to get one euro - while, naturally, down means up - since you need to pay less local currency to buy one euro - but all of this is all incidental, what we are looking at is the relative shape of the respective charts, if all the observed currencies were experiencing the same reaction to the liquidity shock then the shapes should - in theory - be very similar. 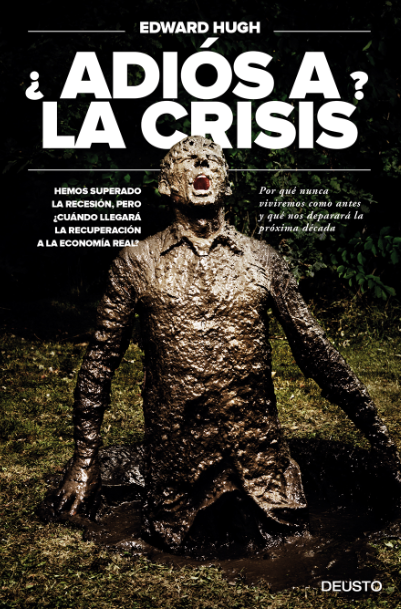 The news about banking liquidity problems or the latest statements from Bernanke, or Marty Feldstein, or Lawrence Summers is the same everywhere, after all. The point is, as will be seen, they aren't, so the question we really need to ask is why aren't they. That is the point of this post. Now, if we take a look at the most recent 24 hour chart for the Turkish lira, we can see that it has been holding pretty firm today. In fact it has even risen slightly. What we can observe in particular in the case of the leu is a sharp fall. Now of course, 24 hours doesn't make a season, but then these are critical days. 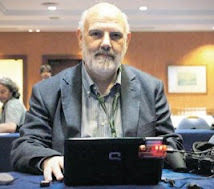 Indeed in some ways this is quite a special moment, since it is so obviously a turning point for all manner of things. And since there are good theoretical reasons - at least if you take demography seriously there are - for imagining that the Turkish economy might well prove to be more robust than some of the Eastern European ones will under the strains the various economies are under and about to receive. These latter economies, despite their apparent vibrance are actually much more fragile under the surface, and it is for this very reason that the observed response differences bear examination day by day. And what a day we have had of it toady. At one point the Polish zloty was down 0.2 percent to 3.8267 per euro as investors await a parliamentary vote on dissolving the assembly scheduled for Sept. 7, a vote which may pave the way for early elections (elections which may pave the way for... well let's not get ahead with our story, we are going to have to wait a bit on this one). 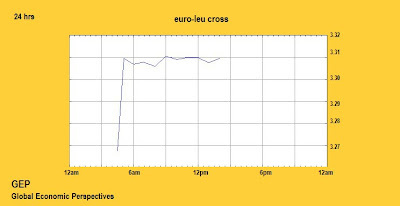 In fact today was the sixth consecutive day the leu declined against the euro, and at one point it was trading at its lowest level in four months, reaching a 24 hour low of 3.2996, the lowest level since May 9. Indeed it was still trading at 3.2963 in late morning trading in Bucharest, down from 3.2700 late yesterday. This morning's slide was a response to a a report showing economic growth slowed in Q2 2007. The point is, however, not that this slowdown could be seen as especially bad, indeed on some arguments it might be thought of as being welcome, since the Romanian economy could be considered to be showing signs of overheating, rather what is significant is the way in which investors are responding to such news in the context of rising concern about the possibility of a US recession and of an associated global credit crunch. This situation is increasingly leading investors to sell off what are seen as higher-risk, emerging-market assets. Romanian growth in the preliminary Q2 2007 GDP reading, after all, only slipped to 5.6 percent, from 6 percent in Q1. 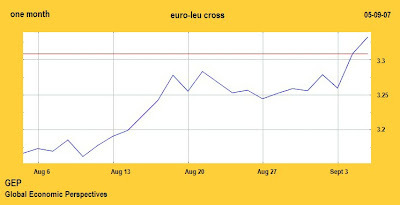 On the other hand the leu has now dropped 3.8 percent in the past month against the euro. Danske Bank analyst Lars Christensen has also picked up on what has been happening to the leu, and has published a research note which I reproduce in this post, since I essentially agree with the substance of what he has to say. 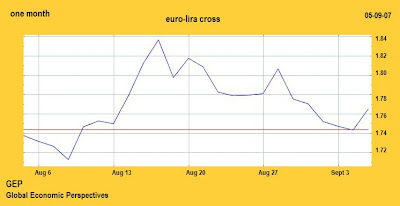 Now such comparisons get to be a little more interesting if we stay with the lira and the leu, and look at the two-year euro-cross charts. 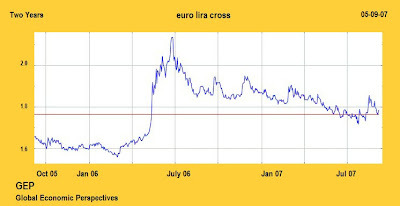 What we can immediately note, of course, is the battering the lira took in mid 2006, following the crisis which took place then. 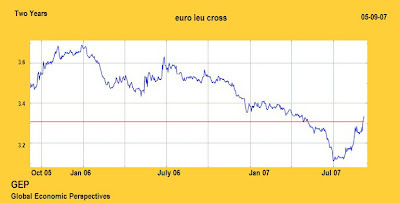 But if we strip this crisis out we can identify a reasonably similar upward trend in both currencies since mid 2006. Until we get to mid July 2007 that is. Then the turbulence really started to set in. And both currencies took a hit, but what is most interesting to note is how the lira initiates a recovery which is then - more or less - sustained, while the leu begins a downward march, a march which seems to be steadily continuing. This becomes absolutely and spectacularly clear when we look at the one month charts. 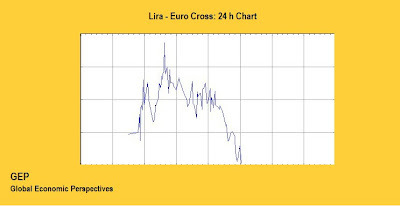 The lira bottoms out somewhere in the middle of the month (remember, upward movement here means decline) while the leu seem steadily to be headed off into the sunset on the right of the chart. Now lets watch out for what happens next. As I say, some explanation for why I hold the view that the underlying macro fundamentals in the Turkish case are fundamentally sound to come tomorrow.